Police Targeting Oakland's Black Venues? Businesses say the crackdowns by OPD and other agencies have been "heavy-handed" and have resembled "search and destroy" missions. The owners of several Oakland dining and entertainment venues that are popular with African Americans say they recently have been subjected to police intimidation and harassment. The raids, by members of the Oakland Police Department and other agencies, were purported to be "compliance checks," involving suspected violations of state statutes and local ordinances. But several business owners said the raids were excessive, even frightening — especially considering the bureaucratic nature of the alleged violations — and some were left shaken by the experience. Several of the venues targeted constitute a major section of Oakland's downtown nightlife, including Oasis Restaurant and Bar, Oyster Reef Seafood Restaurant and Bar, AIR Lounge, and Club Paradiso. The owners of two other establishments, Arsimona Bar and Lounge on East 11th Street and Celestine's Fine Dining and Entertainment in East Oakland, have formally complained about what they said were similar police incidents in June and December of last year. Among the charges are that Oakland police — either solely as an OPD operation or in conjunction with state agencies — entered the establishments in large numbers during peak hours, searching records, demanding business licenses and employee identification, and preventing customers from leaving or entering in a manner that may have permanently driven some customers away. In formal complaints to city and state officials, venue owners or their representatives have called the police incidents "heavy-handed and unprofessional," and "search and destroy" operations. By far, the most disturbing allegations were sent last summer to Oakland City Administrator Dan Lindheim by Celestine Hardy, owner of Celestine's restaurant on Edes Avenue. In her letter to Lindheim, Hardy said that "in the early morning of June 5, 2010, members of the Oakland Police Department aggressively entered my premises as though they were troopers on a search-and-destroy mission. Approximately six officers and one sergeant entered my establishment accompanied by a patty wagon along with several members of the Oakland Fire Department, indicating they were there to shut me down." Hardy said in her letter that OPD officers and fire department officials "interrogated" her and then issued her a citation, threatening to arrest her if she did not sign, adding that she was "shaking, perspiring and crying profusely" during the interrogation. Hardy said that during the June 5 police visit she was so shaken that her staff believed she was suffering a heart attack and called 911. But Hardy said the police officers nonetheless tried to continue their interrogation even after emergency technicians arrived and placed her in an ambulance, writing that one officer "continuously banged on the [ambulance] door demanding entrance," and then "abruptly yanked open the door and in so doing ... triggered [a] feeling of humiliation and disrespect, as I was partially dressed." Hardy said that Oakland police and fire officials found no violations during the June 5 visit, and that police officials took back the citation they had originally given her, "claiming it was a mistake." While a spokesperson for the city administrator's office did not reply to a request for a response to the Hardy letter, OPD spokeswoman Officer Holly Joshi said that the letter — which was given to her in conjunction with this article — had been forwarded to OPD's Internal Affairs Department for investigation. Joshi said that "some of the allegations, if true, could rise to the level of misconduct." However, she stressed that she was not speaking for internal affairs, nor was she offering an opinion on the truth of Hardy's claims. Councilwoman Desley Brooks said she has requested a full report from OPD on the allegations by dining and entertainment venue owners, and would make no comment until after that report was received. Brooks said she expects to bring the matter for discussion before the Oakland City Council Public Safety Committee during its regular March 8 meeting. Joshi said that officers of the department's Alcohol Beverage Action Team are charged by state and city law with making what she called "compliance checks" during business hours on establishments serving liquor in the city. However, she added that OPD-initiated operations only involve a small number of personnel — three officers, two police technicians, and a representative from the Oakland City Attorney's Office — and that the larger-scale visits complained of by the entertainment venues were the responsibility of state agencies outside of Oakland's control. Joshi said that the alcohol beverage action team conducted 1,433 site visits throughout Oakland in 2010 alone, and said that the targets of such visits were based both on random selection as well as driven by complaints and histories of prior violations. Joshi denied that such compliance checks were "intended to target one business or type of business." She added that the purpose of the site visits was to bring the venues into compliance with state and city law. "It's not our goal to shut down anyone," she said. But business owners tell a different story. In December, William Jemmott, the lawyer for the Arsimona Bar and Lounge, wrote complaint letters to OPD and the state Bureau of Security and Investigation Services (BSIS), alleging that the two agencies engaged in "heavy-handed and unprofessional behavior" during a raid-like visit on November 19. The Bureau of Security and Investigation Services licenses and regulates security personnel statewide. Jemmott wrote that "at approximately 11:18 p.m., without prior notice, three Oakland Police Department cars and three ... BSIS cars parked in front of the entrance to Arsimona with flashing lights. Two ... OPD officers approached an Arsimona security guard from behind while he was in the process of checking a guest's identification and proceeded to give him a 'pat down.' He was asked whether he was in possession of his 'guard card' and whether or not he was carrying a weapon. Six additional OPD officers and five BSIS officials approached the elevator and stopped patrons from entering the elevator to gain access to Arsimona. The officers prevented access for 20 minutes, creating [a] confusing scene. Patrons left en masse." Jemmott said OPD officers brought all of Arsimona's security personnel to a back office to be "interrogated at length" while club officials were "attempting to maintain some sense of business decorum in a rapidly deteriorating situation. ... [It] looked like a crime scene." Jemmott wrote that while the purpose of the operation was "to determine if security employed at Arsimona had the appropriate licenses... this investigation could have been conducted in a less disruptive manner. The show of force that evening was disproportionate to the nature of the investigation." Jemmott said that in response to his letter, he spoke with an OPD official who told him that any possible discipline of officers involved in the Arsimona operation would be handled "privately and internally." Jemmott said that he never received a response from his complaint from state officials at the Bureau of Security and Investigation Services. And earlier this month, Fessehaye Mebrahthu, owner of the Oasis Restaurant and Bar on 12th and Madison streets, asked Assemblyman Sandré Swanson by letter to investigate a January 13 raid of his establishment. Mebrahthu said his business "was invaded by it seemed like thirty officers," between 8:30 and 9:00 p.m., including OPD, the California Employment Development Department, and the California Department of Alcohol Beverage Control, all for the purpose of looking for workers' compensation violations. During the course of the visit, Mebrahthu said officers searched his office, "checked behind the bar" and "stopped all customers from entering or exiting during the entire time of their presence." Mebrahthu, who said he was fined $6,000 "for not having workers' compensation for my staff," conceded in his letter to Swanson that "it very well may be that my understanding of the workers' compensation law is incorrect. But for thirty officers from varying agencies to invade my business in an intimidating fashion for workers' comp is a bit excessive." 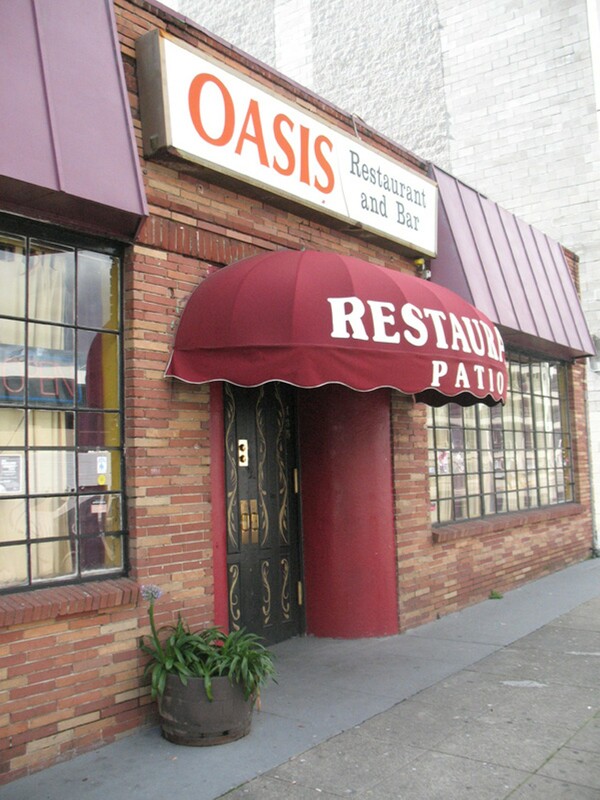 Officers from the same state and local task force that inspected Oasis reportedly conducted large-scale inspections at the Oyster Reef, AIR Lounge, and Club Paradiso in downtown Oakland the same night.